U.S Marshals have captured the latest Most Wanted suspect just a day after being featured on 7 Action News. They arrested aspiring Detroit rapper Dana "BabyTeeth" Henry in Inkster Friday afternoon based off a viewer tip pinpointing his location. U.S. Marshals say the tipster called into Crimestoppers of Michigan Friday morning and a team moved quickly to investigate the home. Henry was arrested without incident. INKSTER, Mich. (WXYZ) — U.S Marshals have captured the latest Most Wanted suspect just a day after being featured on 7 Action News. 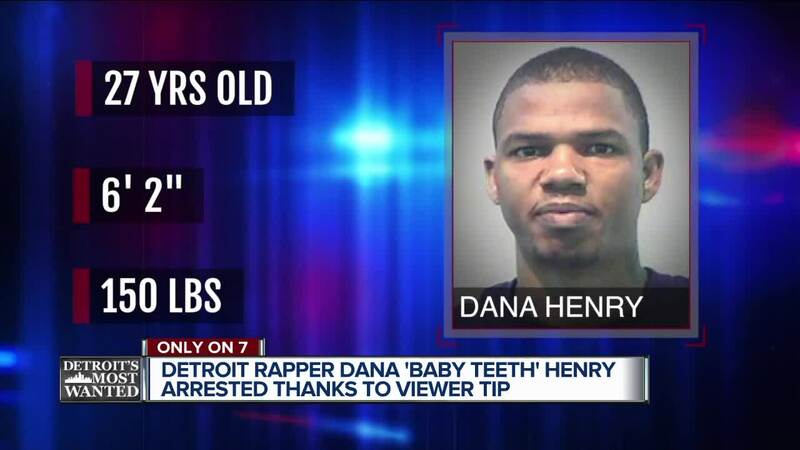 They arrested aspiring Detroit rapper Dana "BabyTeeth" Henry in Inkster Friday afternoon based off a viewer tip pinpointing his location. U.S. Marshals say the tipster called into Crimestoppers of Michigan Friday morning and a team moved quickly to investigate the home. Henry was arrested without incident. Hours after we posted the article to Facebook Thursday, Henry commented on the story questioning the evidence and claiming officials were "defamating" his character. Police say Henry was still freely using social media to promote his rap career. He has criminal history in Taylor, River Rouge, Detroit and Dearborn. Thanks to your help, he is now in police custody.